Model S and Model X referral program winner Bjørn Nyland recently drove more than 150,000 km (or 95,000 miles) with his Millenium Falcon Model S P85. His new battery pack is 1,5 years old as the old one had to be replaced due to a power switch failure. For this occasion, he decided to measure the battery degradation of his car after balancing the cells in its battery pack. What is an unbalanced battery pack? A Model S with a 85kWh battery pack consists of 7,104 18650 Panasonic form-factor Li-ion cells in 16 modules, with six groups of 74 cells per module. Those 7,104 cells charge and discharge at different rates overtime and in different driving scenarios, resulting in variable voltage. 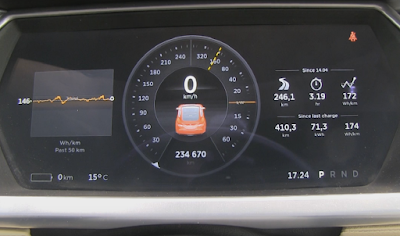 Tesla's BMS (Battery Management System) ensures that battery cells with high remaining capacity are not overcharged when a driver charges the battery to 100 percent. By balancing the cells, you ensure that all cells are outputting the same voltage, this is done through BMS over several days of charging higher than 90 percent. An unbalanced battery pack can take up to two hours to charge the remaining 50 percent of its energy capacity. Bjørn estimates that a fresh battery pack has a practical capacity of 75kWh. 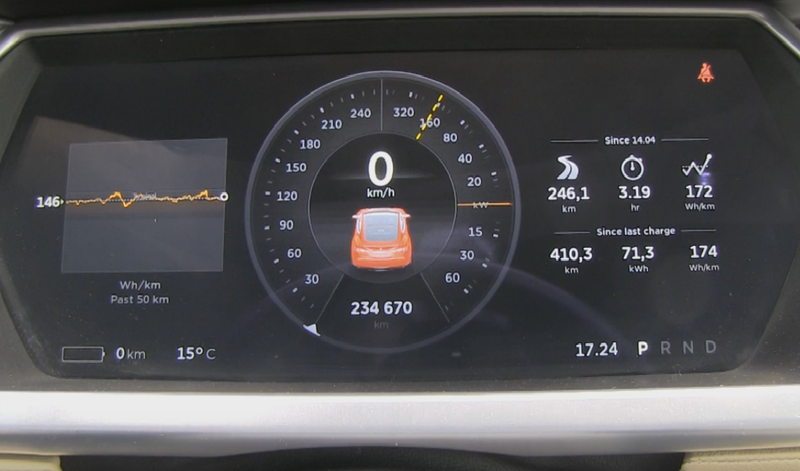 As of late, his car consumed 71.9kWh over a range of 378km, resulting in a 4 percent degradation of 150,000 km. After collecting data from other drivers, Bjørn thinks battery degradation slows down as the cells get older. His experiment yielded a more generous result than others due to the fact he charges no more than 60 percent on a daily basis. 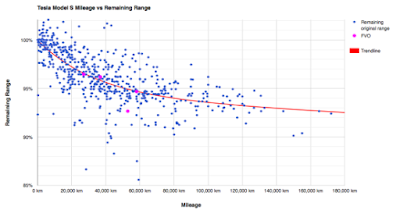 A recent European analysis by Eindhoven University's Professor Steinbuch - from data collected by Merijn Coumans' log file from over 600 Model S drivers - indicates an overall non linear range degradation of approximately 6 percent after 80,000 km (or 50,000 miles), with a rate of better than 1 per cent per 50.000 km (or 30,000 miles) from that point on wards. In addition, a Plug-in America survey of almost 500 Model S vehicles estimated that battery degradation will yield roughly 3 percent degradation the first 50,000 km (or 30,000 miles) but slows down - in a non linear fashion - to 7 percent after hitting the 160,000 km or (100,000 miles) mark. In conclusion, the battery pack should not - in theory - degrade more than the 10 percent mark over 400,000 km (or 250,000 miles) of driving -- or after the 8 year battery warranty from Tesla since degradation slows down over time. These studies, as imperfect as they may be, are one of several other methods to study battery degradation of the Model S. As electric vehicles become more mainstream, it will be easier to collect this data and come up with an accurate analysis of battery behavior through time and distance. When Bjørn receives his Model X (or as he calls it Optimus Prime), he will be documenting the vehicle's battery behavior and comparing it with that of the Model S.
And whats about calendrical degradation?